Log in to your Hosting cPanel. Click the Softaculous Apps Installer icon at the bottom of the screen in the Software and Services section. 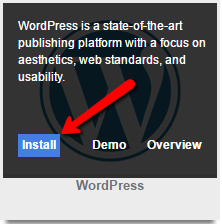 Hover over the WordPress icon and click Install. Enter your Domain in the Chose domain field. Protocol is typically best left alone as http:// and directory should by default be left empty. In the Site Settings section enter your site name and description. In the Admin Account section enter your username, password and a valid email address. The email address is used for lost-password purposes only. Review the information to make sure everything looks good and click the grey Install button at the very bottom of the page. That's it! To start building your site, please go to your domain name/wp-admin (i.e www.domain.com/wp-admin) and use the username and password you just created to log in and start building your site.